Summer is awesome. That’s kind of a given though, right? My particular fetish with summer revolves around vegetables fresh from the garden. As you can tell from other entries in this blog, I’m a meat eater (schnitzel, chicken, bacon, pork). One of the only exceptions I make is when everything is ripe and at its peak in the garden at the same time. June and early July are great for this. If I’m light on veggies I’ll pan fry a pork chop, but usually I’ve got all I can eat with the fresh produce and a nice pan of cornbread. easily made with store bought potatoes for those of you lacking the backyard real estate or who missed the new potato window. We only need a few ingredients to make a lip smacking, go back for seconds, side dish. And that’s all you need. Now wash your potatoes well, peel if desired. The skin on new potatoes is very thin and tender so I don’t peel mine. Cut larger potatoes into chunks so all your potato pieces are the same size. Cover with water, just enough to cover though – any more and you are just wasting time waiting on your pot to boil. Salt the water to taste. Boil until potatoes are fork tender, about 15 – 20 minutes. little milk than after all the milk is added. Once you have your lumps out add the rest of the milk. Continue to stir until mixture comes to a boil. Reduce heat and simmer. This is the thickest your sauce will ever be. If it’s too thick add a little milk. If it’s too thin you can make roux from half a tablespoon of butter and half a tablespoon of flour. Mix roux together thoroughly before adding to sauce, bring back to a boil to thicken. Add salt and white pepper to taste. Taste your sauce! If it needs more seasoning add it now. It’s hard to incorporate after the sauce is clinging to the potatoes. Now drain your fork tender potatoes. Pour sauce on top and viola! 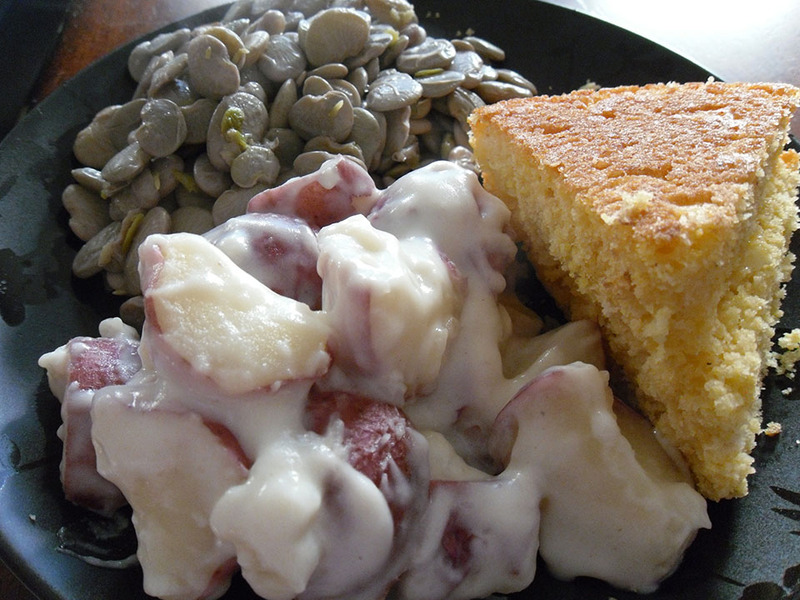 Today’s potatoes accompany fresh corn bread, green seeded butter beans, and fresh tomatoes, still warm from the garden, sliced up and lightly salted. Yum!